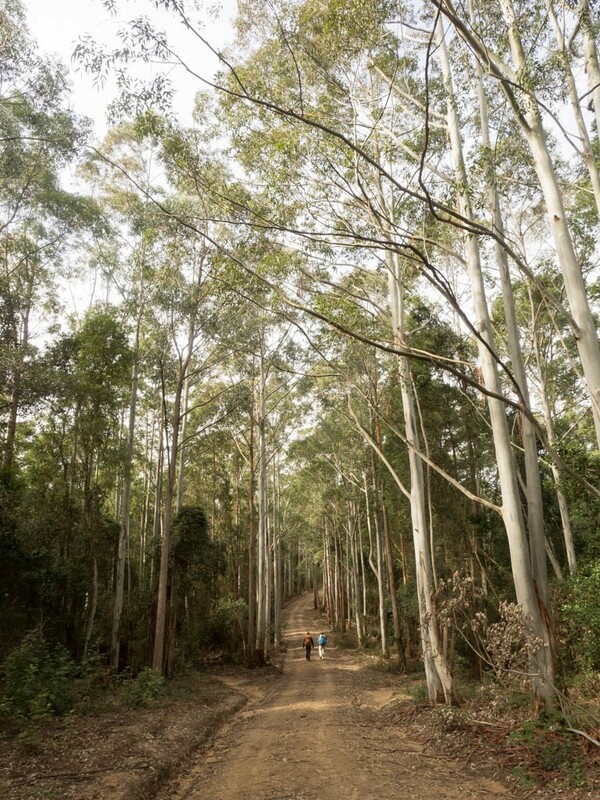 About 1hr north-east of Gosford lies my favourite section of the Great North Walk to date: deep rainforest gullies and tree-lined trails make for standout bushwalking. The campsite was top notch too. The only problem? 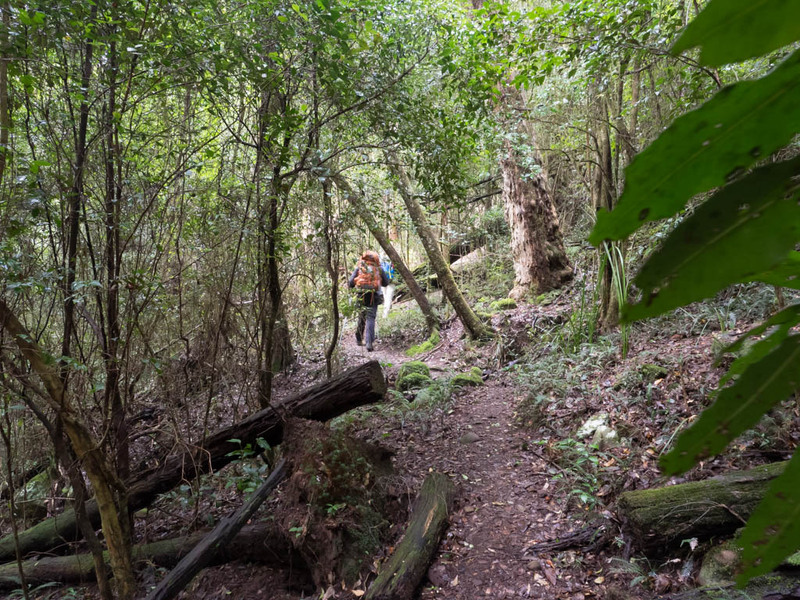 You’ll need to be pretty fit to enjoy the hike into and out of the creek gullies. It’s made harder by the scrambles over and around the numerous blow-downs across the track. Sadly, our mid-winter fitness levels were less than ideal. After catching an early train, I met John and Cole at Tuggerah Station. From there it was an hour’s drive through Wyong’s pastured valleys and up the forested hills that surround Yarramalong and other townships. Then we turned into Olney State Forest. 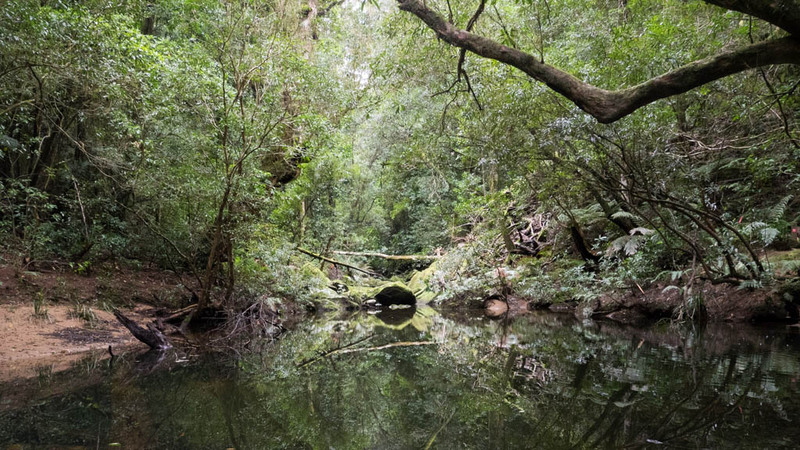 Despite its relative proximity to Sydney and the Central Coast, I had the impression of entering another world as we wound our way up an undulating mountain road, glimpsing eroded mountain ranges through gaps in the trees. From the shady (and dank) Basin Campsite, it’s a 12km walk to the Watagan Valley campsite, and 784 metres of climbing. But with John recovering from a chest infection, and Cole having spent more time buying hiking gear than hiking in recent times (something I can fully relate to! 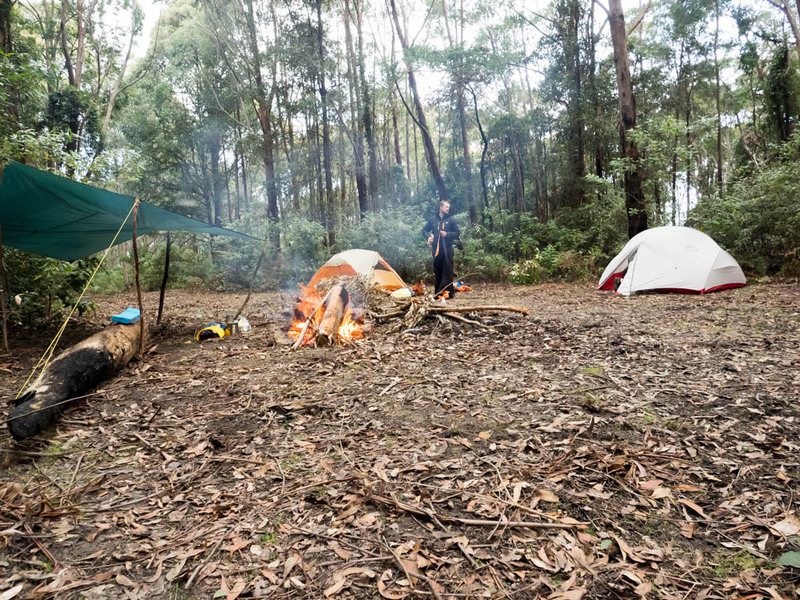 ), we had a plan B: the Mt Warrawolong campsite, which actually sits about 150m below the summit. Camping there would save about 4km and a steep 300m descent/ascent. 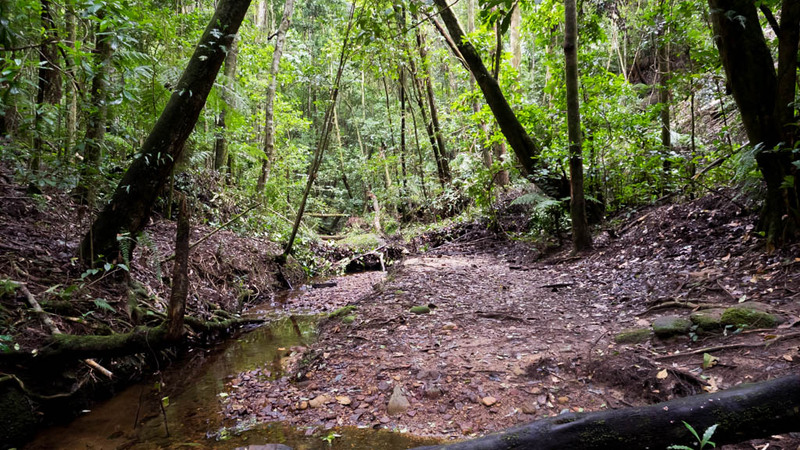 Indeed, we had hiked through rainforest gullies where the canopy was so thick in parts that daylight barely penetrated. 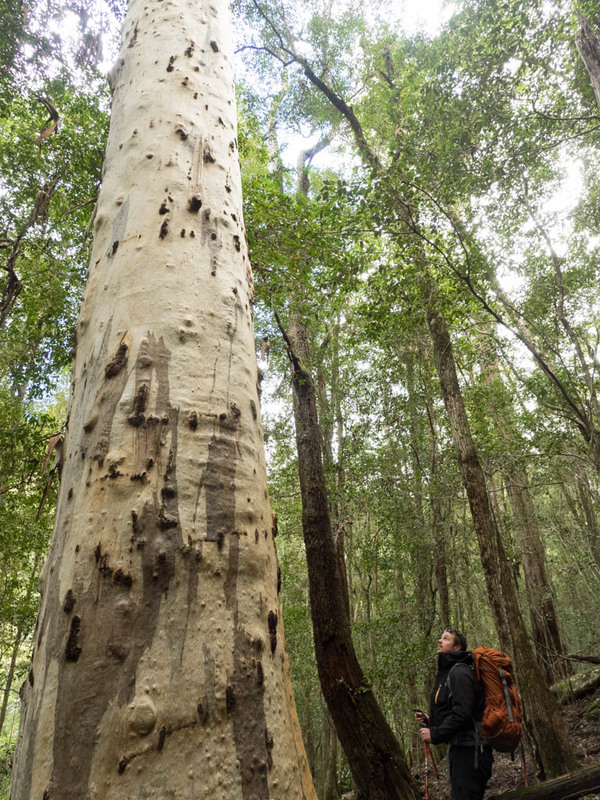 We had walked up forested hillsides and on service trails lined by impossibly tall eucalypts. But not once had we viewed the mountain range around us. 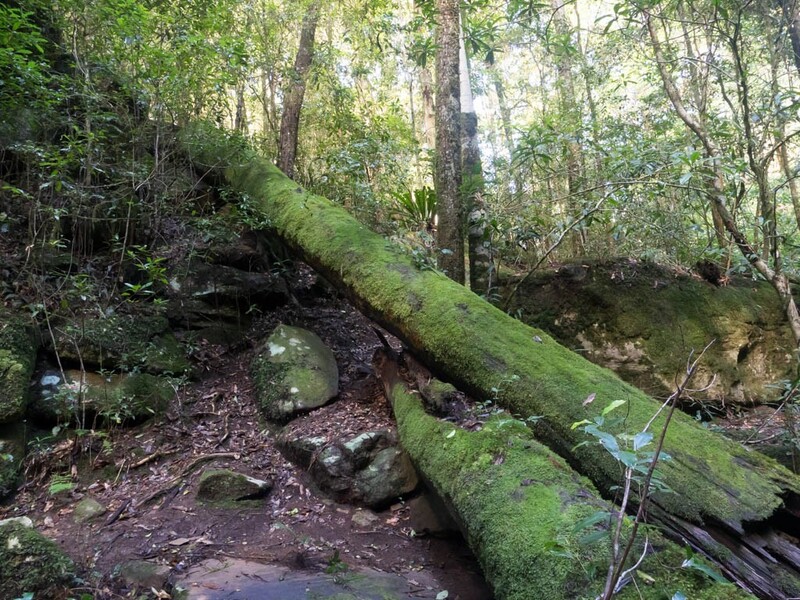 Not that this was a major issue: the rough bushtrack that follows Wollombi brook felt incredibly wild as it rose and fell, its muddy surface slippery underfoot. Vines, mossy tree trunks and overhanging boulders required extra effort. Occasionally, sunlight burst through, tinting the dark creek water a crystal-clear gold. 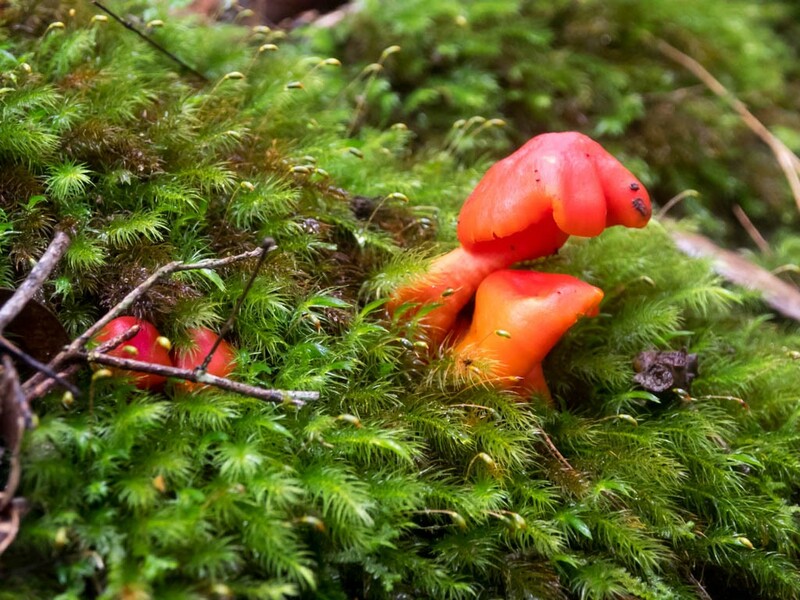 Bright red mushrooms, whose colour screamed ‘Do not eat’, grew along the path as it twisted back and forth. At some points we were at least 15 or 20 metres above the creek – a bad slip would have meant a bad fall. Luckily it was Winter and the cold seemed to be keeping the leeches at bay – by all accounts they are terrible in warmer seasons. 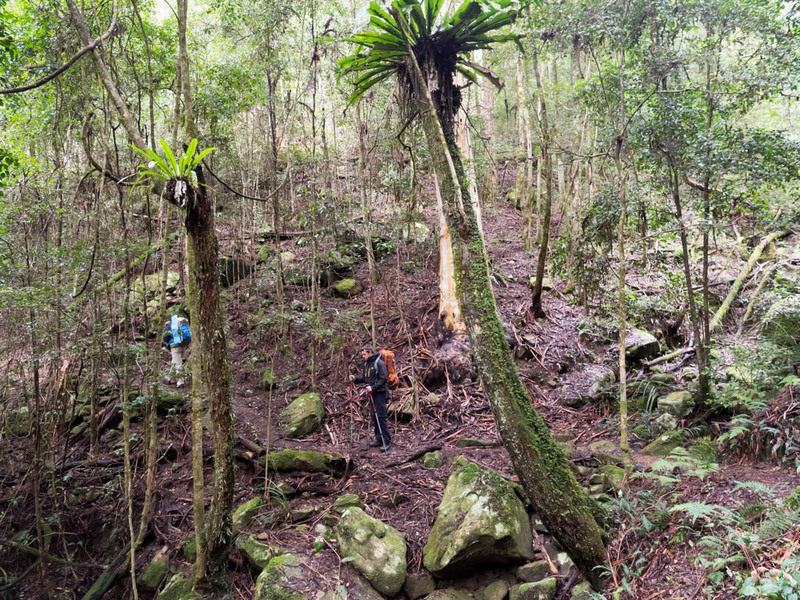 Soon, we crossed a rocky creek bed and began the first serious ascent of the day: a trail – barely distinguishable at times – that rose from rainforest into dry sclerophyll forest where massive eucalypts stood like columns from a long-abandoned city. 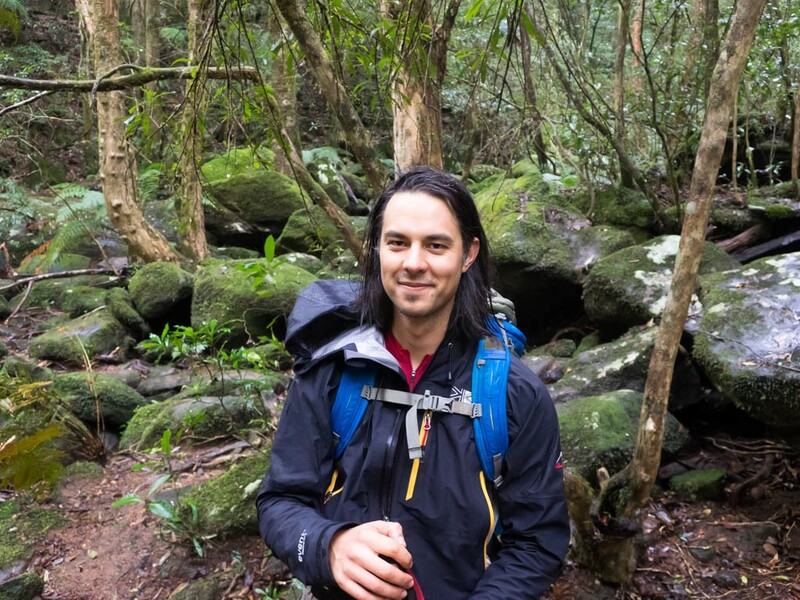 After a welcome stretch of flat road, a descent into and climb out of an even darker rainforest gully, and a fairly relentless ascent to another service trail, the Mt Warrawolong campsite was too good to pass up. It had only taken us 4 hours to walk here but the transition into the state of being that can only come with overnight hiking was complete. In some ways, traveling for 4 hours to do a 4-hour hike seems like madness but when everyone has young families to get back to the next day, you grab whatever snatches of wilderness you can. We spent hours in front of the fire, just talking, eating, being. I hadn’t seen either of my friends since our last hike a few months earlier and this time away from time together was hard earned. We kept warm by the fire but the night was long and cold; we were at the tail end of a record cold-snap. Depite wearing every layer, I couldn’t warm up once the temperature hit its nadir in the early morning, a period of about 2 hours. Neither John nor Cole slept well either. We were all glad to make it back to the car the next day, after a mostly downhill return route in light rain. 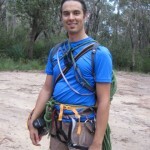 ‘You can tick the Watagans off your bucket list,’ said John as we drove back down the mountain. In my head, however, I was already planning next year’s return and a multi-day traverse of the range… That and a slightly better cold-weather sleeping system. great read – really takes you on the journey. I’d still like to know if the ‘don’t eat me’ mushrooms are poisonous (or to what degree?). I couldn’t find any info online. Thanks John – it was a great journey to complete with you. Maybe we can crowd source the identity of the mushroom? I think each of our hiking stories to date features some form of ailment! Courtesy of @LotsaFreshair and Dave Noble via Twitter: Its a Hygrocybe (wax cap) of some sort. But need to see gills to get closer… Next time we’ll need to look underneath. Thanks Rachel. Funnily enough, that was one of the things I was thinking about! Glad to hear it works for you. I’m also going to look at investing in a hood/balaclava (I have an ultralight down quilt, which is hoodless). The walk was fantastic. Just wish we were all a bit fitter. Hi Jack. What a great discovery! Yes, it’s a beaut little walk through rainforest up to open sclerophyll forest on the ridge. If we had more time, I would have liked to have walked further too. Only caveat: I reckon the creek gully would get pretty leechy in summer. Let me know if you end up doing it. I feel bloody half dead. I had a brain explosion some years ago to do this with my son and walk from Sydney to Newcastle. How ambitious. We spent heaps of dough on lightweight tent, packs, lightweight bags, gators and the fashionable outfit. We hopped of the ferry in Sydney and got to Lane Cove River tourist park. I sort of felt okay but we got a bit lost when we missed a marker. Anyway we did about 15km in summer with 20kg including water. The next day the N Parks people said that there was a high fire danger and it would be 37. No worries we thought. Well we got lost again missing a marker and eventually got on track. Some young kids caught up to us with a school duke of edinburg trip. I heard voices and thought :”terrific our Sherpas are here!” After a day of hallucinating from the heat and my knee giving way I had a gut full and we caught the train home. That darn map mocked me saying it was easy/moderate. You gotta be bloody kidding me. Then I had another bright idea. We do the walk from Newcastle to Sydney and for the first few days we can come home to the luxury of a cold pool and do the real hard stuff in spring or late winter. The Newcastle map said Easy. I like easy. So we stomped from Newcastle to Teralba on some seperate days and today we got to the Watagan map. It said again easy to moderate grading for our 16km walk. My husband got the GPS programmed and we have our beacon and day packs. I was looking forward to another easy walk. The first obstacle was that I left the map at home. Not to be deterred we thought “it’ll be right mate” until we saw warning signs of road closures due to mine subsidence. Mmm… We pushed on. Each time we thought we were on top of the darn mountain we turned a corner and copped another climb. I felt like a mountain goat. When we came to a ridge and had to severe drop offs on either side I felt a bit queesy. Brave that and turn back when we are nearly at the end. Nah, push on. Blow me drunk we get to go down and I spent most of the time sliding down the rocks on my rear. Anyway we made it to Heaton Gap Trackhead. I reckon we will do another bit in the next couple of days if my son is still talking to me. Hi Linda. Thanks for sharing your GNW story! Classic. Glad to see you’ve kept a sense of humour throughout it – and good on you for coming back for more! It reminds me of some of my early overnight walks. 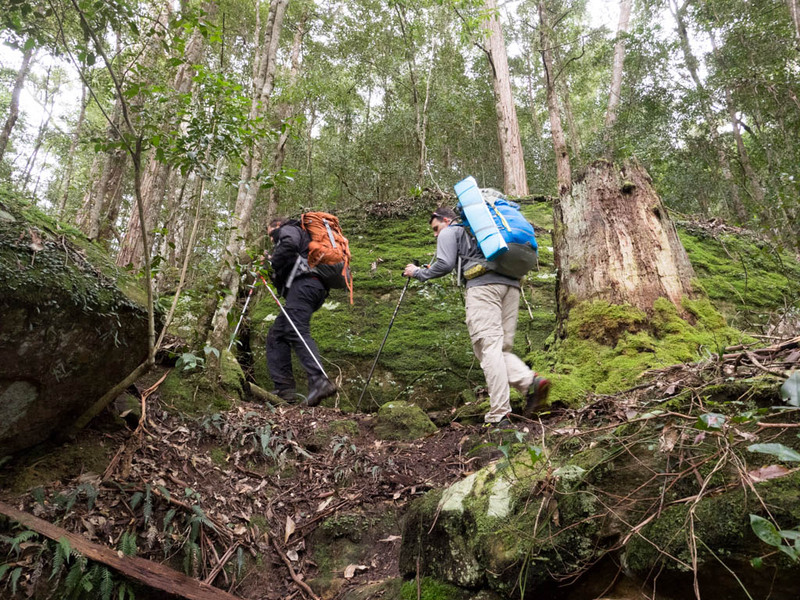 When I took John on his first overnight walk (the Coast Track in Royal National Park) our knees both gave out too and we literally had to hobble to Otford on Day 2 – luckily only about 10km or so. Suffering is definitely part and parcel of any adventure. Well done pushing through the Watagans too. Looking forward to doing the Heaton Gap section one day (though I’ll be careful of that ridge section!!). Your description brings back memories of seeing my somewhat unfit walking partners grimace their way up the final climb to the campsite! Oh, and hiking some of those sections in 30+ degree heat would awful! No wonder you suffered. I’ve all of my GNW sections in Autumn, Winter or Spring.